As our closest allies, our friends are genuine, kind and accept us as we are. Celebrated each year on the first Sunday of August, National Friendship Day was declared a holiday by US Congress in 1935, to recognize the importance of friends. 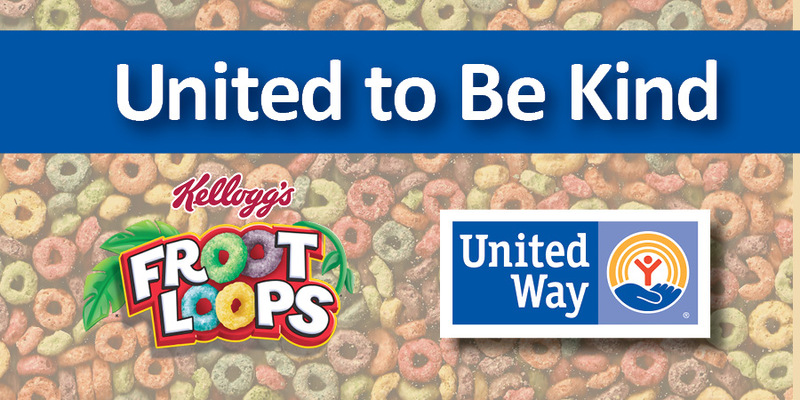 In honor of National Friendship Day on Sunday, Aug. 5, United Way of King County and United Way of the Battle Creek and Kalamazoo Region are collaborating with Kellogg’s® Froot Loops® to promote anti-bullying, launching its United to Be Kind program. Throughout the week of Aug. 6, attendees at United Way of King County’s Summer Meals program and United Way of the Battle Creek and Kalamazoo Region will participate in activities and conversations that embrace uniqueness, individuality and friendship. To learn more about this initiative, we sat down with Chris Stolsky, Associate Director, Brand Marketing for Froot Loops to learn more about the partnership. Why is Froot Loops joining the fight against bullying? What does “Whatever Froots Your Loops” mean? Our slogan, “Whatever Froots Your Loops”, means to embrace and encourage individuality – to be your authentic self and have fun while doing it. Young people who are perceived as different from their peers are often at risk for being bullied. Committing to the fight against bullying is a natural extension of our belief that we should all embrace our individuality and be accepted for what makes us unique as individuals. How did your anti-bullying cause develop into United to Be Kind? Froot Loops believes everyone has the right to be authentic, original and to do “Whatever Froots Your Loops.” In order to prevent bullying, adults need to help kids understand what bullying is, keep the lines of communication open, encourage them to do what they love, and model how to treat others. United to Be Kind is committed to reaching children and addressing this very important issue. United Way’s mission to improve lives by mobilizing the caring power of communities around the world, advancing the common good, is a natural extension to spreading kindness. Being a good friend, accepting of others and being kind, are all avenues to eliminating bullying. Together, we’re Uniting to Be Kind. How is United Way helping to support this effort? United Way is a passionate driver for communities. It fights for the health, education and financial stability of every person in every community. And that includes children. By partnering to provide activities and conversation around friendship and anti-bullying, we hope to help students embrace kindness for the upcoming school year and long into the future. For more information on bullying visit http://stopbullying.gov.